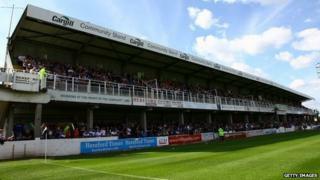 Hereford United has been given another week to pay off debts after a hearing at the High Court in London. The club met with creditors last month but plans for a Company Voluntary Arrangement were rejected by HM Revenue and Customs (HMRC). Hereford United was expelled from the Football Conference in June and has been facing a winding up order if it failed to find enough investment. The High Court has given the club seven days to arrange payment of its debts. The petition was brought by HMRC, which was owed £170,000, the club's former manager Martin Foyle and assistant Andy Porter. Hereford United has been on brink of being wound up for months, but recently announced new investment and started selling season tickets. Club chairman Andy Lonsdale said: "Although this is not the outcome we expected, a few things had changed regarding the winding up order since the last time we were in court, so it is only right that the club now go away and adjust accordingly. "We still remain positive that the business of Hereford United Ltd will continue." Martin Watson, vice-chairman of Hereford United Supporters Trust, said: "This case has been going on for over 90 days now. They've had a string of adjournments and they've got another one. "They say they've part-paid Martin Foyle but we don't know exactly how much, but it's taken them most of those 90 days to make even that part-payment. "They've had a one-week adjournment before and all the court watchers and experts would normally say that is a sign of the court's patience wearing thin."